Akira Toya (塔矢 アキラ Tōya Akira) is a character in Hikaru no Go. Akira appeared first in Game 2. Already at that point a professional-strength player, Akira loses to Hikaru Shindo (Fujiwara-no-Sai is actually playing). In a rematch two weeks later, Hikaru (with Sai actually playing again) wins again, which leads to Akira's chasing Hikaru, including joining the Kaio Middle School Go Club. 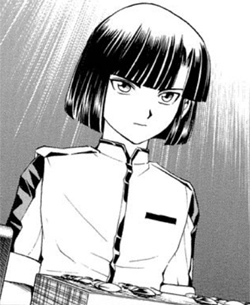 Akira is the son of Toya Meijin (real name Koyo Toya), a Go professional, and Toya Meijin's wife, Akiko Toya. After Hikaru messes up their game in the middle school matches, Akira is offended enough to finally take the Pro Exam, which he goes through with one loss. The loss is a forfeit when he skips Day One for the internet match with Sai. Akira, who uses the screen name "akira", loses to Sai, who uses the screen name "sai". He quickly rises through the ranks to 3-dan. Akira plays a game with the holder of the Oza title, Zama Oza, in the Yugen no Ma in the Japan Go Association (Nihon Ki-in) building. Akira loses to the Oza after a vicious game. Akira is set to play against Hikaru in his first Pro Game, but when Toya Meijin collapses, Akira forfeits the game. Later in the story,when they finally play in the Meijin title's frst qualifying round, Akira has the realisation that he and Hikaru are destined to be rivals, and a friendship ensues. Akira makes the Hon'inbo League once, though Akira drops out of it (known games were defeating Ichiryu, and losing to Serizawa, Ogata and Zama). He is first board for the Japan/China Hokuto Cup match,and second board for Japan/Korea. Akira's voice actor (seiyu) in the Japanese version of the anime is Sanae Kobayashi. In the English version his voice actor is Scott Perrie. Akira's importance is immeasureable,as he is one of the three major characters (with Hikaru and Sai). Akira's intensity to Go and his position as rival and later friend to Hikaru shapes the series.